What is the difference between our Standard web site layout and the 2 Column layout. Well, actually the standard began as a three column layout, but wasn't referred to as being such as it was irrelevant until we came up with a two column layout. We began using a two column layout because effectively eliminating the first (left) column allowed for a wider right column which may be better suited for some gadgets (apps) such as slideshows, video, Twitter feeds and the like. 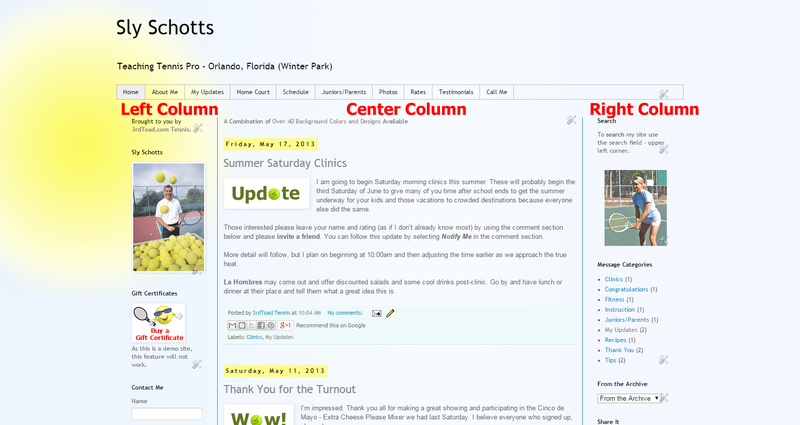 This main or center (now left) column, or rather the page and posting column, remains the same width. Some simply find the 2 Column layout more appealing. You can easily change the layout at a later time, but you will want to re-position some of your gadgets as part of doing so. You can choose if you would prefer a 2 Column layout for any theme when selecting your web site theme on our Baseline Info form.